There’s been a few Stuff the Bus events around the area lately, but none more accessible to Tysonians than one planned this Saturday from 10 a.m.-3 p.m. at the Walmart Supercenter. Prepackaged supplies are available for purchase at the Walmart at 1500 Cornerside Blvd. Each paper bag of supplies costs $4.72. 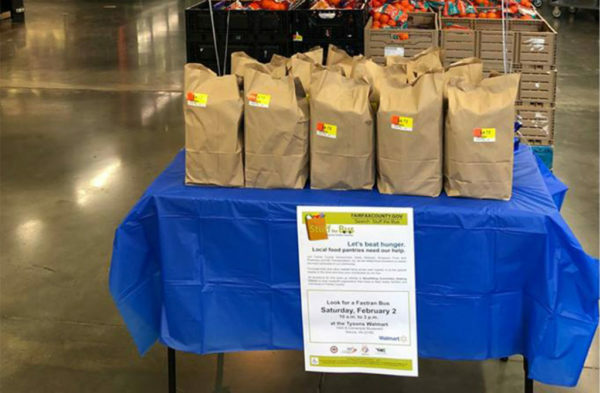 The Stuff the Bus event in Tysons will benefit the Committee for Helping Others (CHO), an all-volunteer organization in Vienna that provides food aid, clothing, furniture and other emergency needs throughout the area. A few Stuff the Bus events have already been held around Tysons, like one a few weeks ago at a Giant in McLean. In addition to the Tysons event, one will be held in that Herndon Giant at 2425 Centreville Road from 9:30 a.m.-3 p.m benefitting LINK. If you can’t make it out to the Stuff the Bus event but still want to help, the CHO is in need of volunteers for the food, clothing, and emergency assistance programs, as well as drivers for the furniture program. Donations to the group can be made by calling 703-281-7614 or emailing [email protected].